Execute every stroke in our Neoprene Swim Gloves. Built for controlled movement in the water, the webbed design of the TGLO6 strategically conforms to the shape of the hand. With a durable construction, every pair provides open water and triathlon swimmers with the insulation needed for cold water swims. To find the correct size, measure the width of your palm (horizontally). Measure width of palm horizontally. So far so good, I've only used them once since receiving in the mail. They fit well and are comfortable to use. Had to send back because too small. I could not even get all my fingers past the wrist band! Q: Will they keep my hands dry? A: Will help insulate for cold water swims. Will not keep your hands completely dry. Q: Hitting the backs of my hands on the side of the pool.Causing bruising.The pool is configured so this can happen. A: Our Neoprene Swim Glove is built for controlled movement in the water, the webbed design of the glove strategically conforms to the shape of the hand. With a durable construction, every pair provides open water and triathlon swimmers with the insulation needed for warmth. 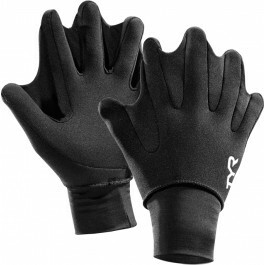 The neoprene should also help protect your hands. Q: Are these legal for Ironman swims? Q: How do I best determine what size glove to buy, is there a sizing chart? Q: I have used BlueSeventy swim gloves and was very disappointed. My hands get cold swimming in the sea and thought they would address my problem. After a short while they became very loose around the wrist. Do your gloves stay tight around the wrist and stop water getting in? Ta in advance for reply. 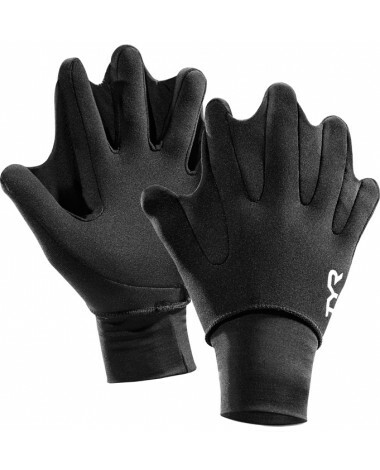 A: The Neoprene Swim Gloves are designed to insulate and protect with a secure fit. However, because wrist size varies across body types, we cannot guarantee that water will seep in if bunching / gapping occurs. Also, fabrication is not water proof.